Does anyone remember the Miss Glitzy jingle performed by local band “Only After Coffee” a few months ago? The band has kindly produced a refined version of the jingle and Miss Glitzy’s really loving the song! I have even set it as my ringtone! 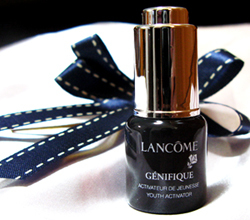 I’m giving a deluxe Lancome Génifique 7ml (worth S$40) to a lucky reader who spread this awesome tune around! If you comment, tweet, facebook and blog, you’ll have 4 chances to win! I will picked a person by 5th Dec 12.00pm (GMT+8) via Random.org. Christmas season is early at Miss Glitzy’s Monologue so do your part to spread lovely music to everyone! I’ve always wanted to buy this for my mom but it’s too expensive. Thanks for the chance! What a lovely holiday treat it would be to win this! Thank you! Great song! The singer sort of has an Amy Winehouse sound which I like. This would be a nice holiday gift… to myself 🙂 Thx! This would make a great gift for my mother! I keep hearing about Genifique’s magical powers and would love to try it for myself! I have never heard the jingle before. Thanks for the chance at this great prize! This would make a great gift for my mom! not sure how the jingle goes w/the product, but would love to win it!!! Cute jingle! I set it as my ringtone! Love the jingle! SMOOTH yet snappy. Cute jingle! Love the old-timey sound of it! I like the jazziness of it…the voice is a little on top of the music though…needs a bit of blending. I tweeted this giveaway/jingle at http://www.twitter.com/fotomacro. I like the jingle pretty well!